The temperatures are warming up, summer is stretching before you, and it’s time to make the most of the porches and patios that are part of the homes in Lakeville MN. Whether you keep it simple with just a porch swing and some flowers or go all out and build the equivalent of a second living room in your backyard, there are plenty of materials, fabrics, styles and more to consider. No matter the size of your outdoor area, it is important to consider the overall look you want for the space. Traditional? Modern? Tropical? Bohemian? Consider the look of your home’s exterior and try to find materials and colors that will complement your home. One of the biggest issues, obviously, is the type of furniture you choose. Each one has its pros and cons, depending on how much work you want to put into them during the summer and also during the winter months. 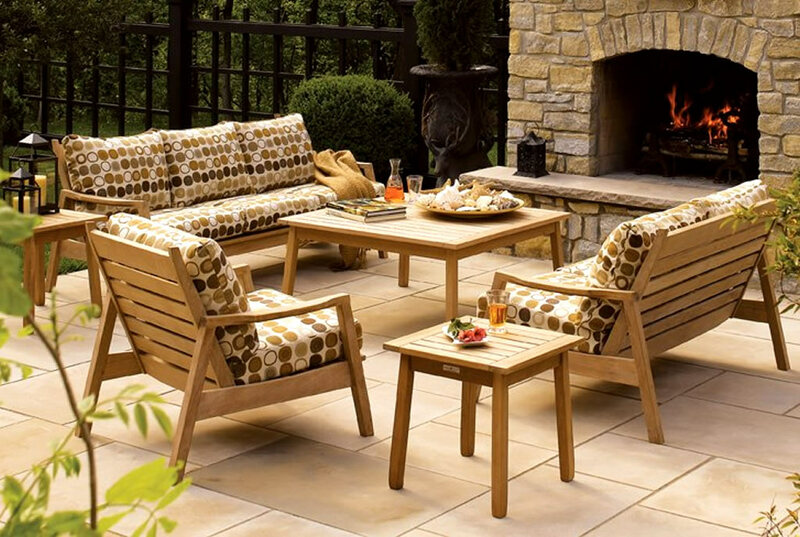 Teak is beautiful and long-lasting, but it does require care during the summer and covering during the winter. Powder-coated aluminum furniture is fantastic for those looking for a modern design and the furniture only takes minimal cleaning. It’s also light enough to rearrange during parties. Synthetic wicker is hugely popular for its longevity and appearance, though it does take a bit more cleaning due to the texture. Plastic/resin is probably the most popular due to its versatility and low-maintenance. It comes in a variety of colors, finishes and designs and usually only takes minimal soap-and-water cleaning to keep it looking fresh all year round. No matter what material you choose, if you plan on using your outdoor furnishings often, it’s usually worth it to pay a little extra for both appearance and durability so that it looks and feels good year after year. Once you have the basic furniture picked out, think about the soft furnishings, such as chair cushions, throw pillows, seating puffs and more. If your furniture is a neutral color, this is a great way to add color and personal style to the area. Because of the exposure to the elements, look for fabrics that are UV-, water-, and mildew-resistant and that can also be washed. Polyester is cheap, but it wears out fast, so it’s best to look for olefin, a synthetic fiber, or an acrylic where the color is infused into the fibers for easy cleaning and longevity. The infused-fiber materials are great for outdoor rugs, which will really pull a patio space together and make it more defined and polished. It’s also offers protection for bare feet. If your back patio area isn’t covered, consider adding an awning or purchasing an umbrella, especially if you have a table for dining outdoors. The awning is great for providing protection from the sun outdoors, as well as indoors if the sun tends to make certain rooms warm during the day. An umbrella, on the other hand, is easy to open and close as needed and can add another pop of color and design to your patio area. While homes in Lakeville MN may not get to use their porch or patio as long as other parts of the country, you can always extend the season a few weeks longer with a stylish fire pit and some pretty throw blankets. Along with some atmospheric lighting, be it candles or strings of small bulbs, gathering with friends and family around the fire pit is a wonderful way to cap off the summer season.